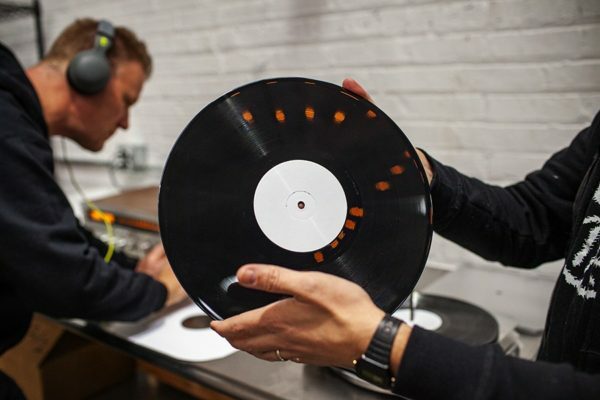 CHICAGO (WBBM NEWSRADIO) — Inside the former Hammond Organ Factory on Chicago’s North Side is the city’s first vinyl pressing plant in decades. Open the sliding door and you’ll hear the sounds of music in the making, literally. “I’ve been with CHIRP radio since they went on the air. As part of the local music scene, I saw this niche,” Weber said. Despite having virtually no experience in the record production business, Weber said they took a leap of faith. The heart of the operation is the first steamless press in the world. It can turn a handful of PVC pellets into an LP in 30 seconds. Weber said there are a couple steps that happen before it gets to the vinyl press.